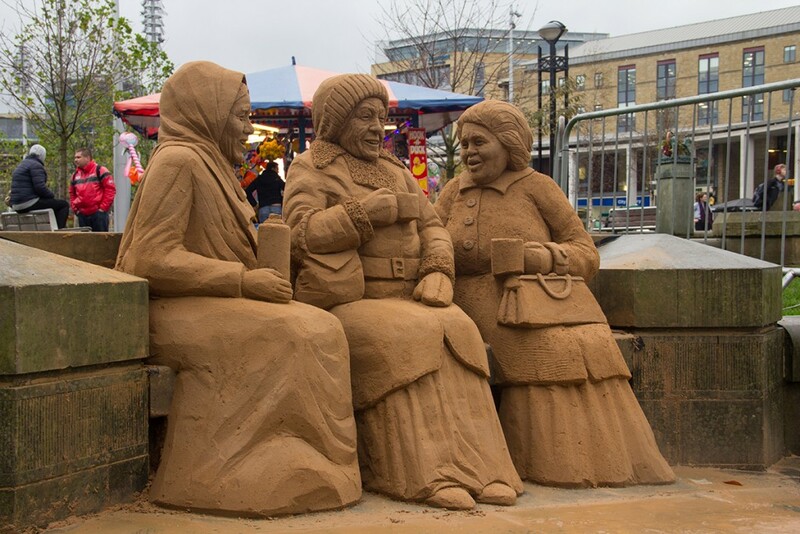 The Bradford Sand Sculpture Trail was called ‘Discover Bradford!’ and was a series of sculptures throughout the town that celebrated Bradford’s cultural heritage. 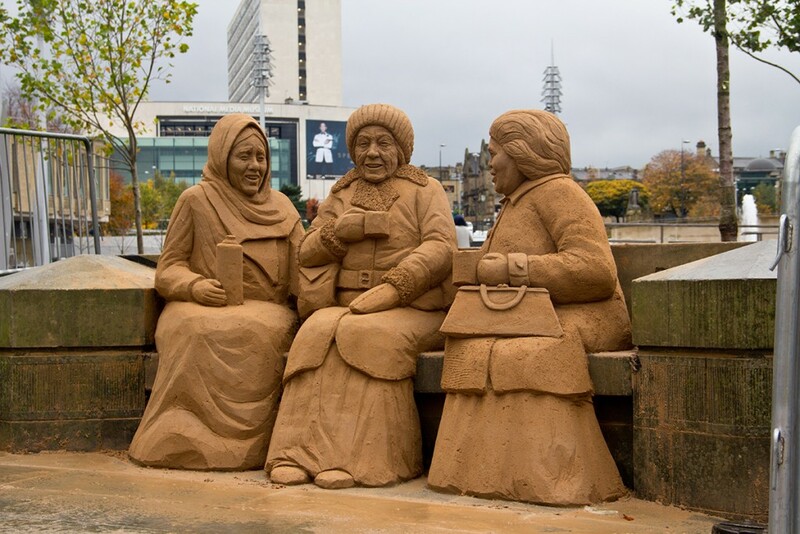 This for me was a wonderful project as being a Bradford Lad I got to research from Doomsday accounts until the present day all things Bradford and discovered myself many things that I didn’t even know about. 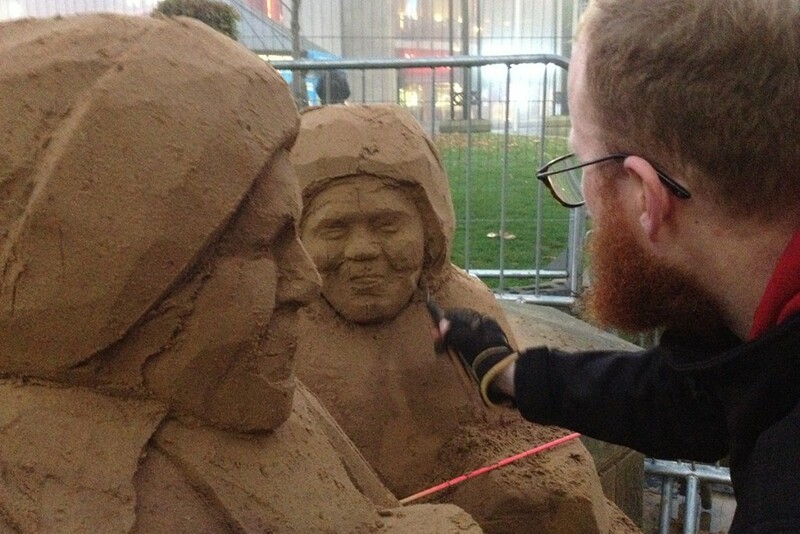 I think even Claire from Lancashire was impressed. 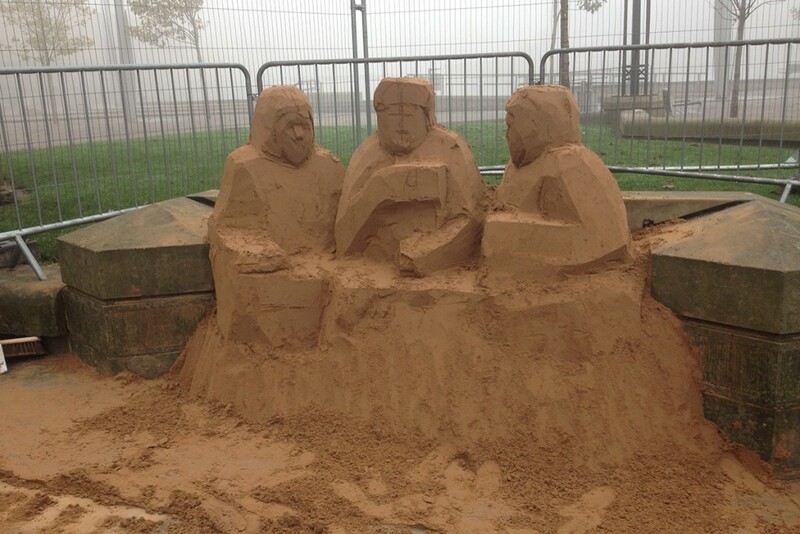 The trail was commissioned by Bradford Council and with Allyson, Vanessa and Jonny we stomped around the city and looked for suitable locations. There were many challenges for us at Sand In Your Eye as we decided the sculptures were to be not only outdoors in November, but also in tiny shop windows, a shopping centre, a bank, a bus station, a window ledge a story up, the top of a doorway and even on an existing bench! 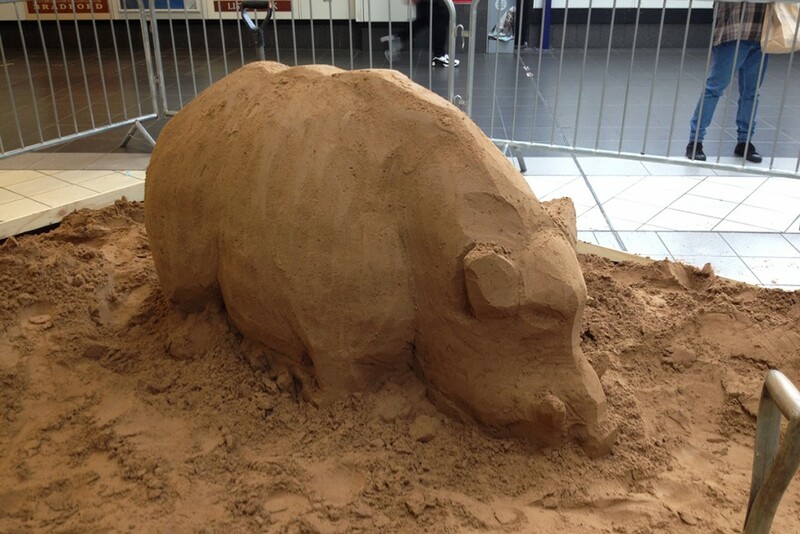 Two immediate challenges to working indoors were that the sculptures had to be light as shops are not made to take tonnes of sand and in a few cases although the shop window would make a wonderful display area there was no room to actually make the sculptures there. So on the spur of the moment we said airily “Oh it’s OK we can make them in our workshop and transport them there”. We had never transported a sand sculpture before. Tom my fellow sand artist looked a little worried. 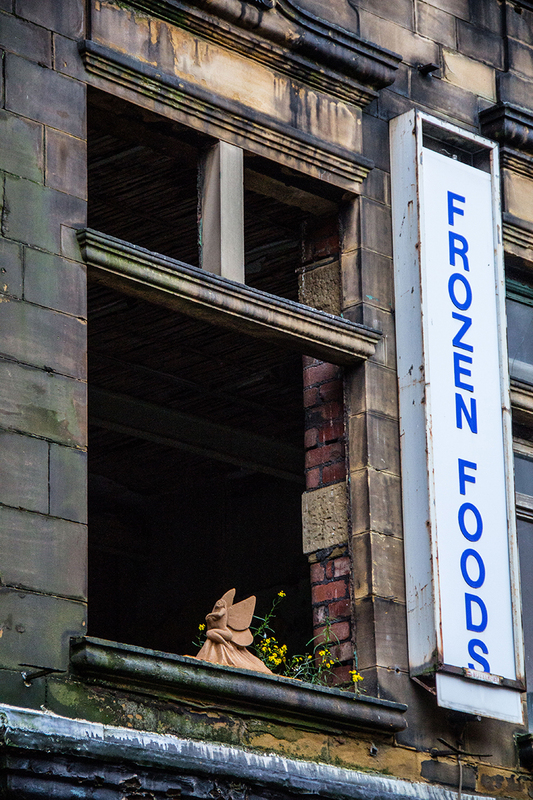 The name Bradford has origins from the ‘broad ford’ that would have been in the village back in the 1300’s. During this time there is an account of a wild boar that terrorized the countryside and a reward was put on its head by the Lord of the Manor. A huntsman promptly killed the boar and cut out its tongue as proof only to be cheated by a second huntsman who claimed he had killed it and produced the head of the boar. But then the head did not have a tongue, so the first huntsman got the reward! In 1801 Bradford had a population of only 6000 but by 1851 it had risen to 103,000 as a result of the Industrial Revolution. Bradford rapidly became the ‘wool capital of the world’ as the textile industry grew. 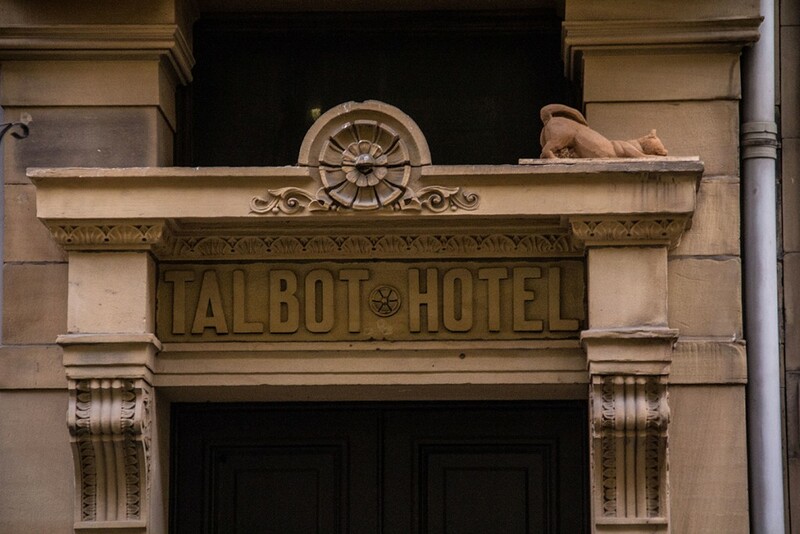 Our city’s historical wealth can clearly be seen when you admire the incredible Victorian Architecture. But lets not forget the humble sheep that helped get us there! 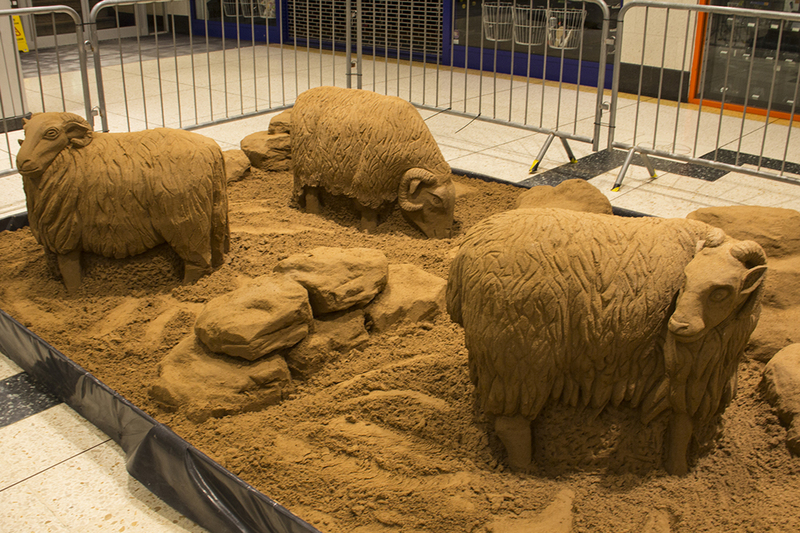 Kirkgate Market kindly hosted the sculpture and let us bring in 4 tonnes of sand whilst no one was looking in the early morning, contained in a nice sand pit. Three weeks later they were whisked away with not a grain of sand left as evidence. During the Industrial revolution lived some sisters called the Bronte’s who wrote some wonderful books. Emily Bronte was born in Thornton village in 1818 and was a novelist and poet who is best known for her only novel Wuthering Heights which has brought the moors of Yorkshire to the imagination of the world. 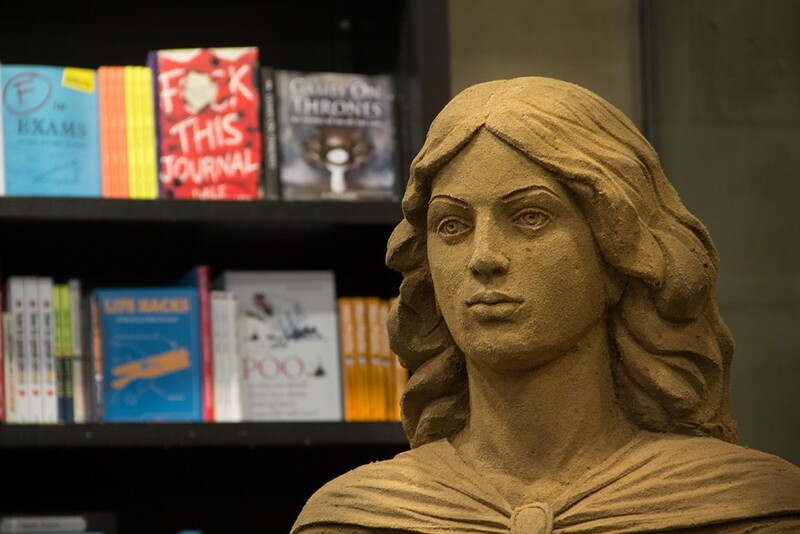 I made Emily in Bradford’s Waterstones which is housed in the magnificent Wool Exchange where traders would buy and sell wool. This was a particularly challenging sculpture as we were unable to use the 2 tonnes required as the old building wasn’t quite up to it. So we made her upper torso on pallets and then sat her at a normal table writing. 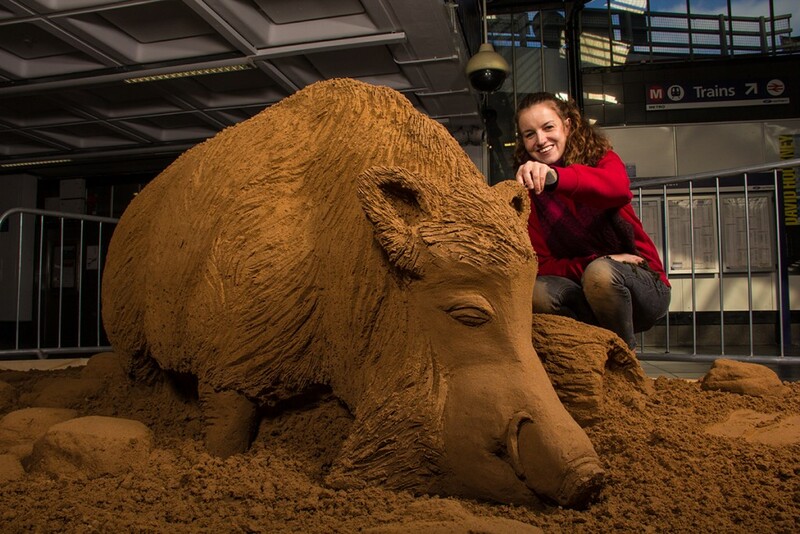 This meant that the sculpture only weighed around 400kgs during compaction and around 150kgs once made. During that early dark winter week it absolutely poured it down with rain so it was wonderful to be inside in the warm working under stone arches of the Wool Exchange. Ian the manager and the staff were so accommodating with coffee, cakes and anecdotes that on many occasions I would fall into a daydream of working in this bookshop housed in history and warmth. Waterstones kept Emily Bronte for two months until the New Year where she sat quietly in the shop window greeting people as they came through the door. 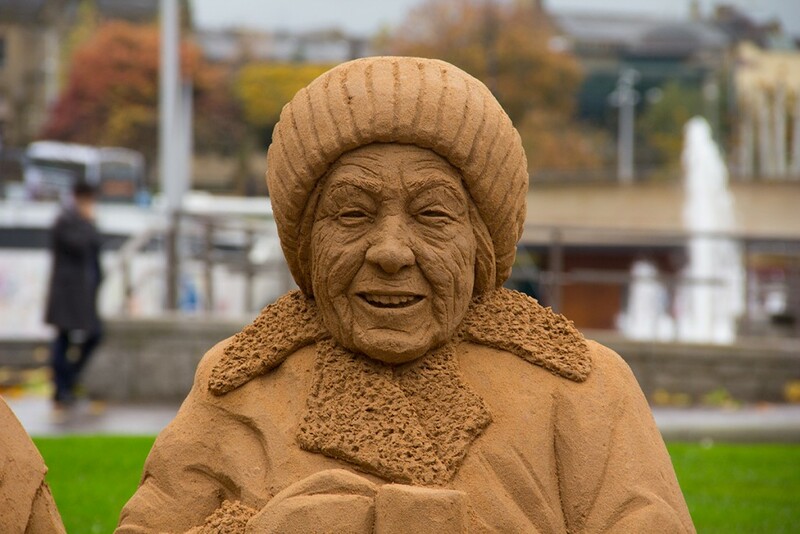 When the time came for her to be removed we then did something quite remarkable if you happen to be a sand sculptor. The Cottingley Fairies appeared in a series of photographs taken by Elsie Wright and Frances Griffiths in 1917. Until the 1980’s the public were divided on whether the photographs were real or fake until Elsie admitted that they were cardboard cutouts. However, she maintained that the 5th photograph was genuine. 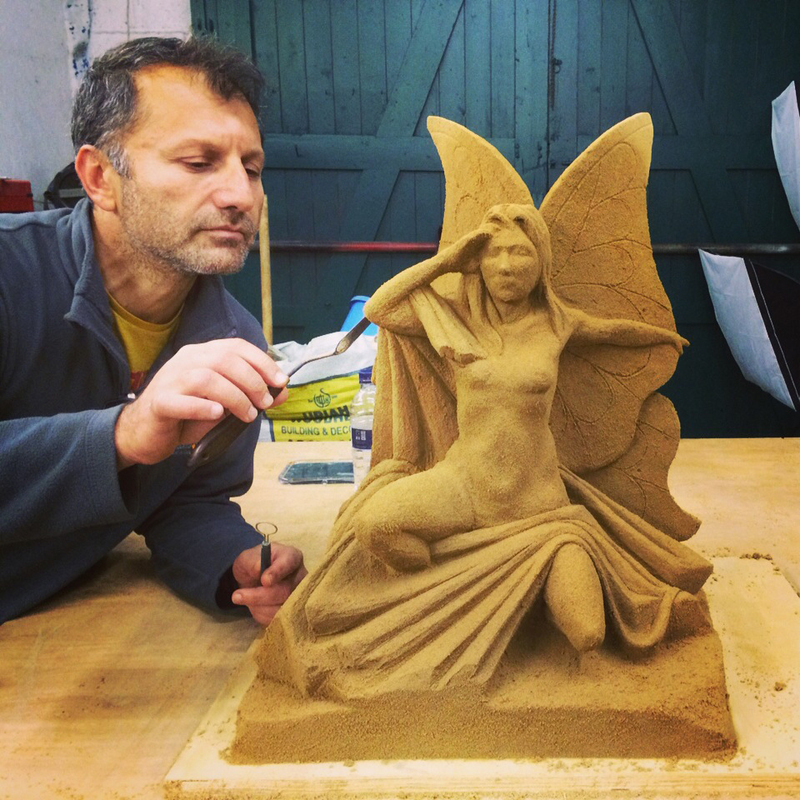 Yadgar Ali made these wonderful fairies. One was to be placed in a small window of Santander Bank and another on a derelict window ledge a story up at Rawson’s place. 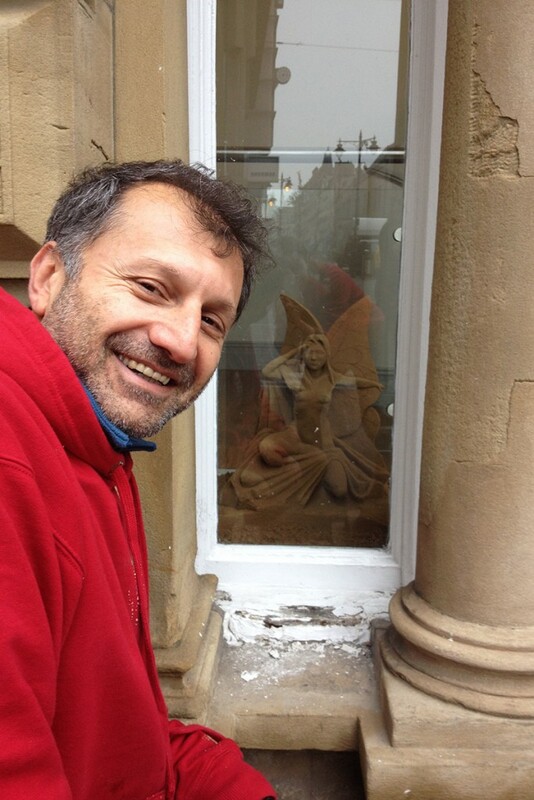 The window of Santander would have been impossible to sculpt in and we don’t recommend making sculptures high up on a window ledge either! 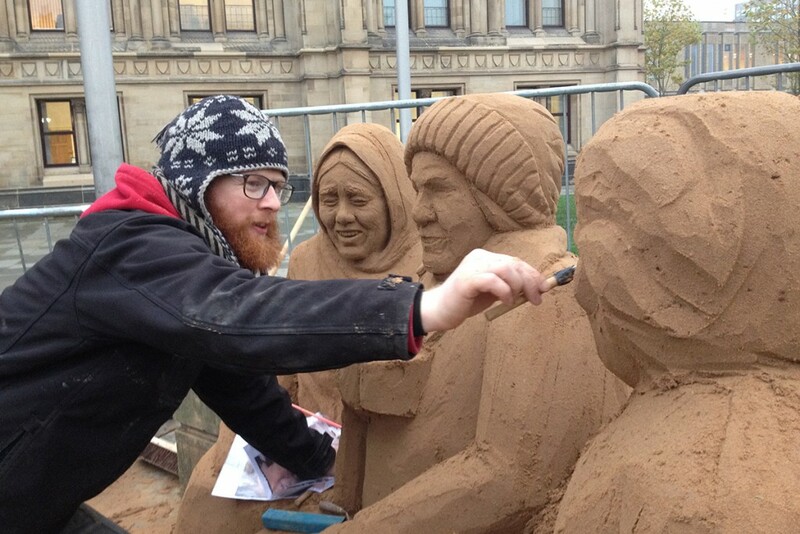 So the plan was to make them in our workshop, dry them out by the fire and then transport them to their homes in Bradford the best we could. “Are you sure they will be OK?” Yadgar asked on more than one occasion. “I’m not sure Yadgar, but there is one way to find out!” Yadgar met this woolly confidence with raised eyebrows followed by a master plan on how to package each sculpture in a bubble wrap infused wooden box to protect them during transit. Andy then set about making the boxes that would later prove almost impossible to unpack at the other end! The larger fairy looked particularly fetching as her head popped out of the bubble wrap whilst riding in the front of the van and she looked somehow pleased with herself once she made it safely to her new home. She is there until this day looking out of the window of Santander. During the Industrial period sanitation was at its worst as Industrial towns suffered from open sewers and a plague of rats and mice. Our feline friends were there to help! Claire made the cat in our workshop in Bradford and then we transported her to her place of residence high up on the stone doorway of Talbot House. This was a very good one for the trail as it was not so easy to find! The little cat is still having its morning stretch to this day. In 1911 the second FA cup was made at Fattorinis in Bradford and in the same Year Bradford City lifted the FA cup in victory. The FA cup used today is a replica of this original masterpiece which is now too delicate to be used. 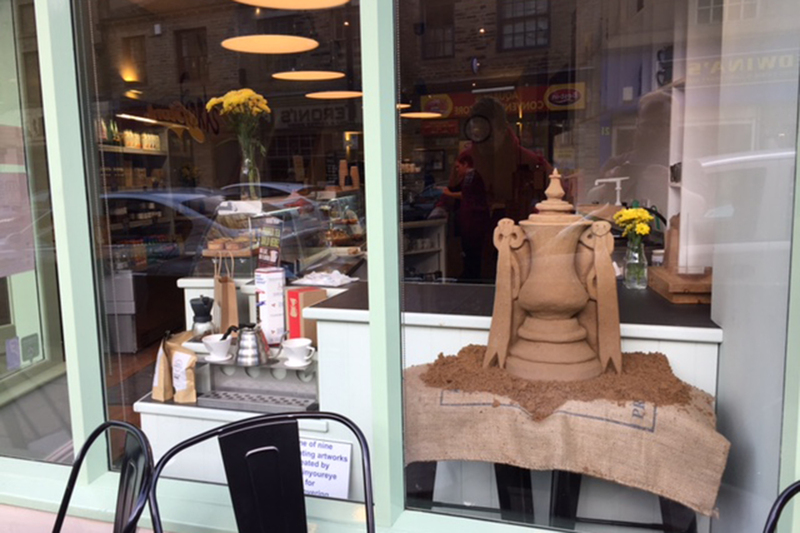 The sculpture was displayed in the shop window of Forks café but was made in our workshop and then installed as it would have been a bit of a squeeze otherwise. Forks café is a social enterprise providing aspirational work experience and training. 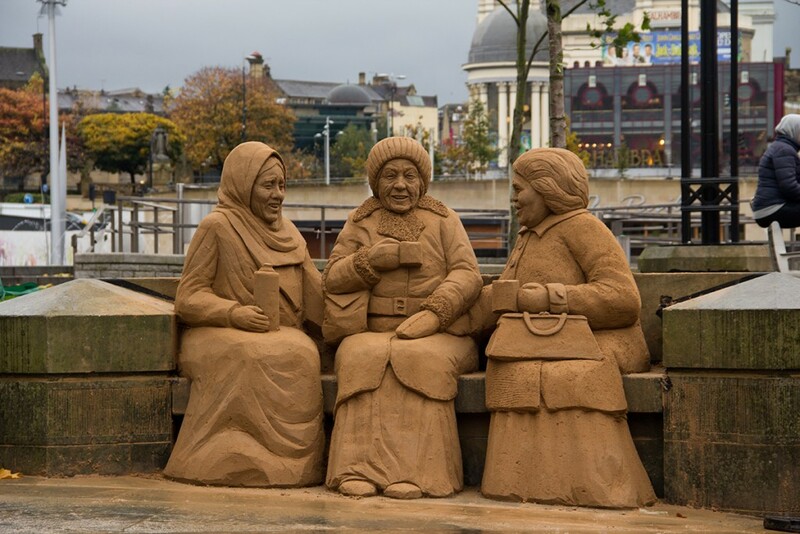 It is owned by the Bridge Project, Bradford’s leading charity providing support to individuals and families suffering from the consequences of drug or alcohol dependence. What a wonderful place have a sculpture. I believe it is there to this day. A surge in Industry in the 1950’s and 60’s spurred a mass immigration from the West Indies, Pakistan, India and Bangladesh to help support emerging industry. Bradford now enjoys a cultural heritage that has routes from across the globe bringing a wonderfully diverse community together represented by our cultural bench where such rich conversation and can be enjoyed by our three elderly ladies over a cup of tea. 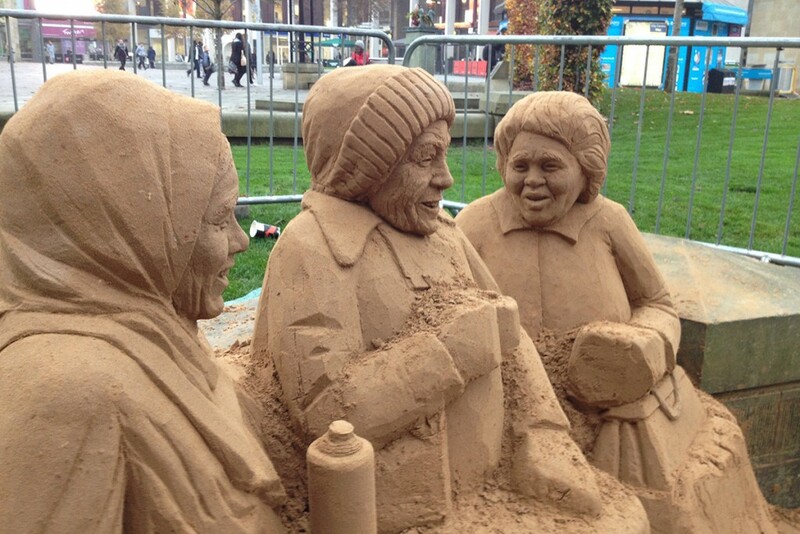 Claire and I made this sculpture together and we decided to ask a friend of mine Lucy if she would pose as the lady in the middle. She has such a beautiful face full of joy and character that I couldn’t think of anyone more suitable. So we popped round one evening, took some photos and had a cup of tea and biscuit. Tom and I then had an interesting day compacting the sand into an existing stone bench which was a little bit unorthodox when making a sand sculpture. After lots of head scratching we finally completed the task ahead of schedule and so celebrated with a beer. 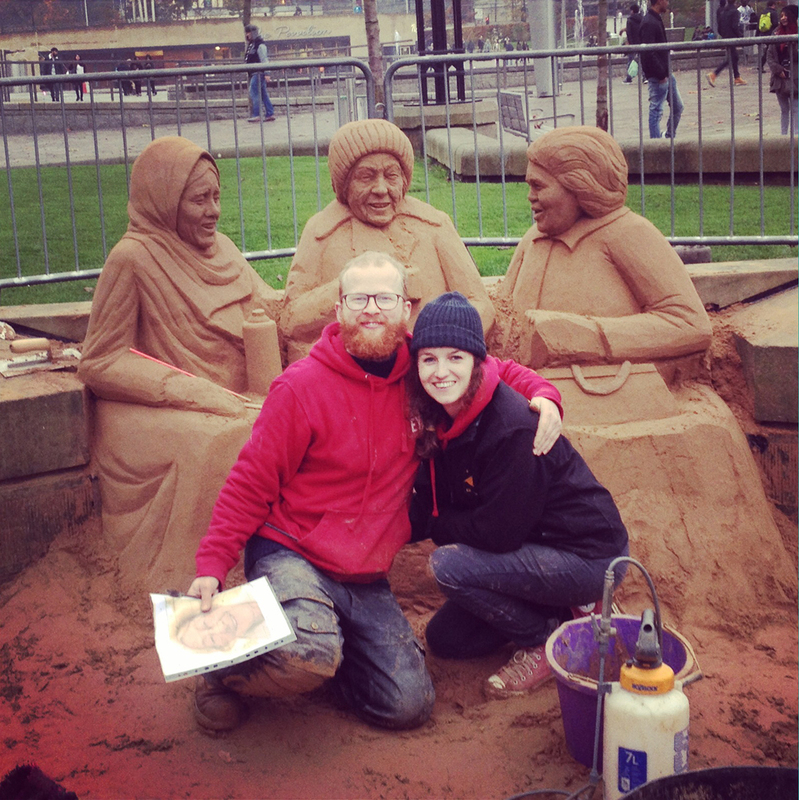 Claire and I had such a lovely time making this sculpture. 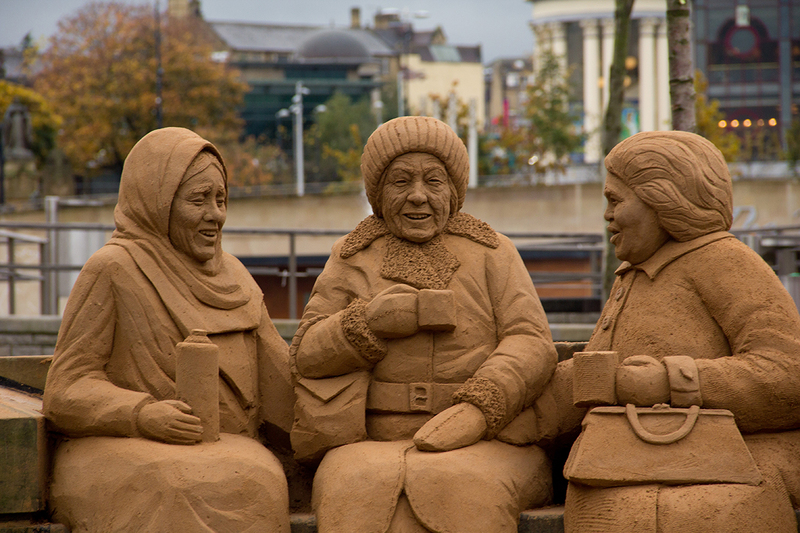 As the ladies faces emerged you could really feel the rich conversations full of humour between them and this was evident by the effect it had on people who stopped in their tracks to have a look. 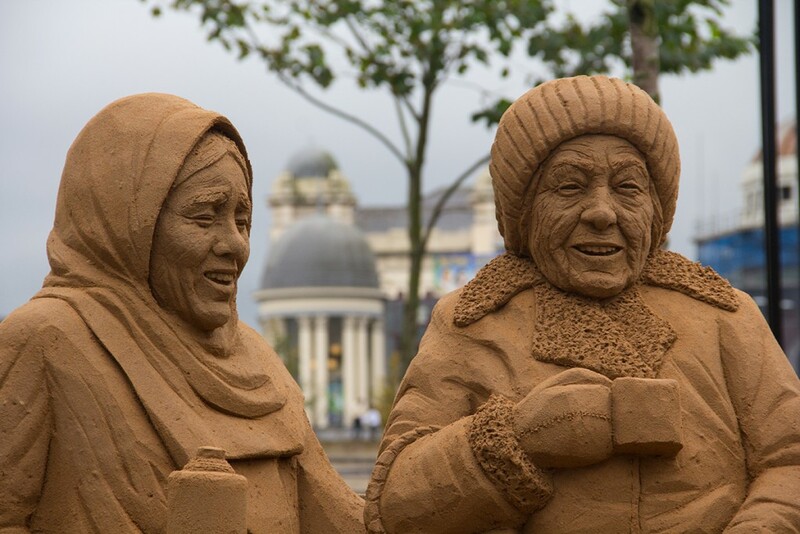 This sculpture really resonated with the people of Bradford and we enjoyed wonderful conversations with people from all different cultures as was its intention. 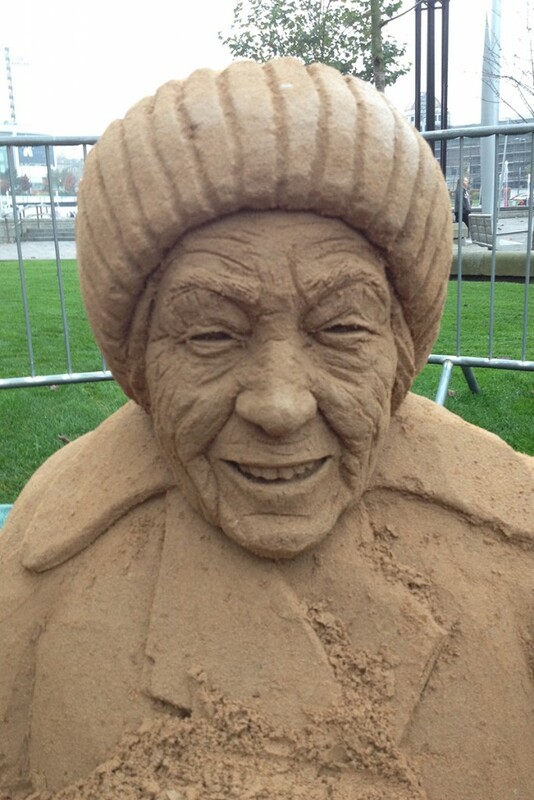 The sculpture became even more enjoyable as Lucy’s face began to emerge laughing in the middle. 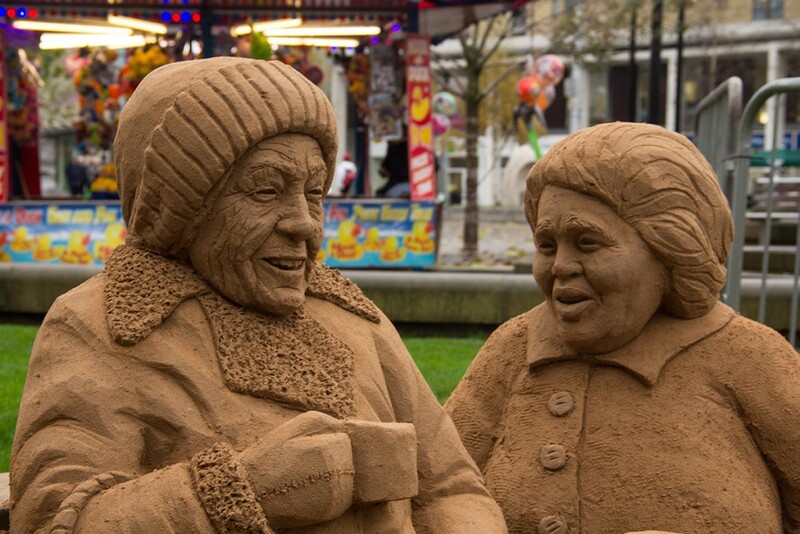 This may seem strange, but when a sculpture is laughing, it really does prompt you to laugh back. After the trail we took Lucy out to dinner to thank her and Claire printed out some photos for her of her portrait in sand. I’m not sure if Lucy was flattered or offended! Thank you Lucy. 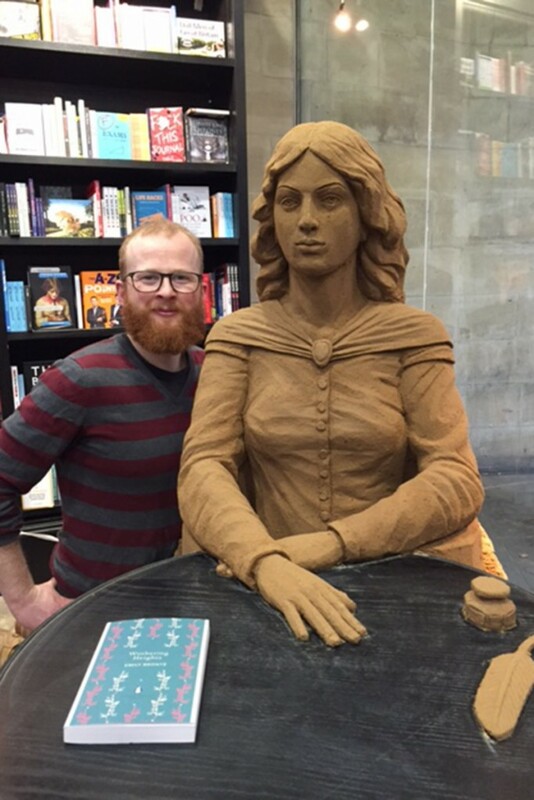 The fate of Emily Bronte! 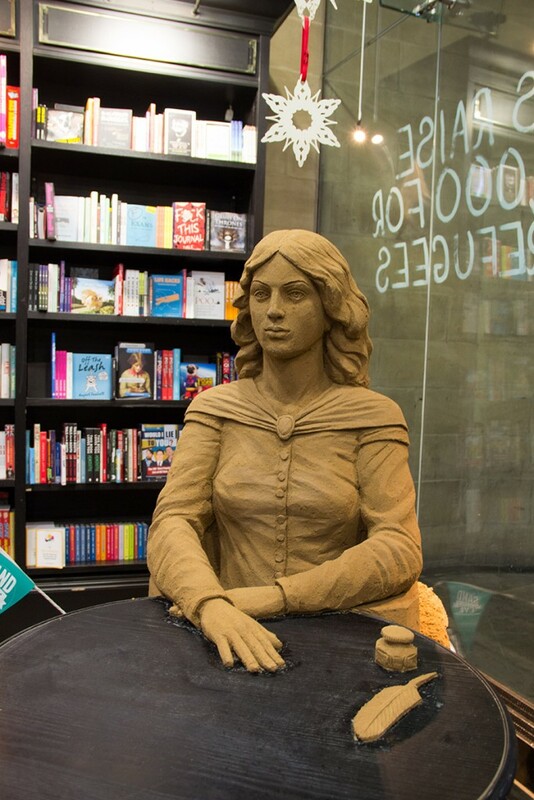 After the success of moving the other smaller sculptures Tom and I had the notion that when the time came to remove Emily Bronte from Waterstones we would attempt to move her rather then dismantle her as would be the normal practice. 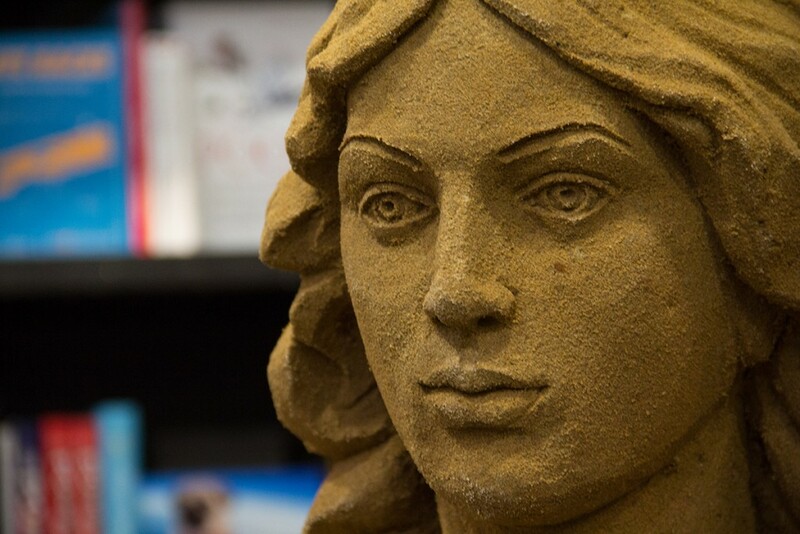 This of course would be extremely challenging as she was a large sculpture and her head was very delicate as the area of the neck was undercut causing a severe overhang. 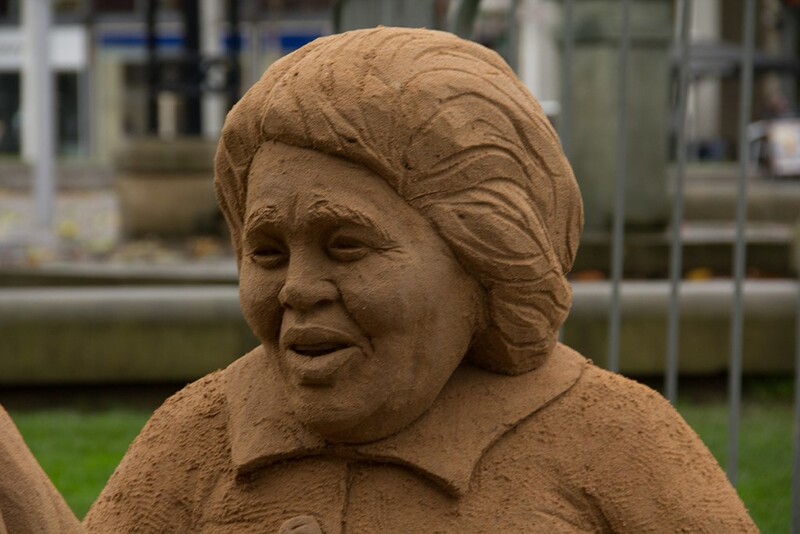 The manager Ian, had asked when originally making the sculpture “Could you just not make her outside and wheel her in?” to which I replied that her head would just fall off with the vibrations. 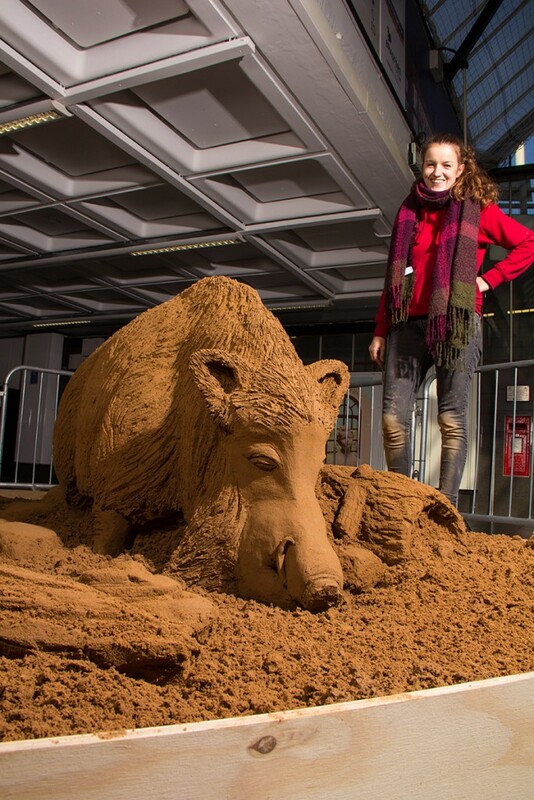 The difference was that after two months she was now totally dry, and building sand once dry becomes very hard and much stronger than wet sand. So Tom and I pulled the van up as close as we could and then as gently as possible moved the sculpture onto a lifting table. 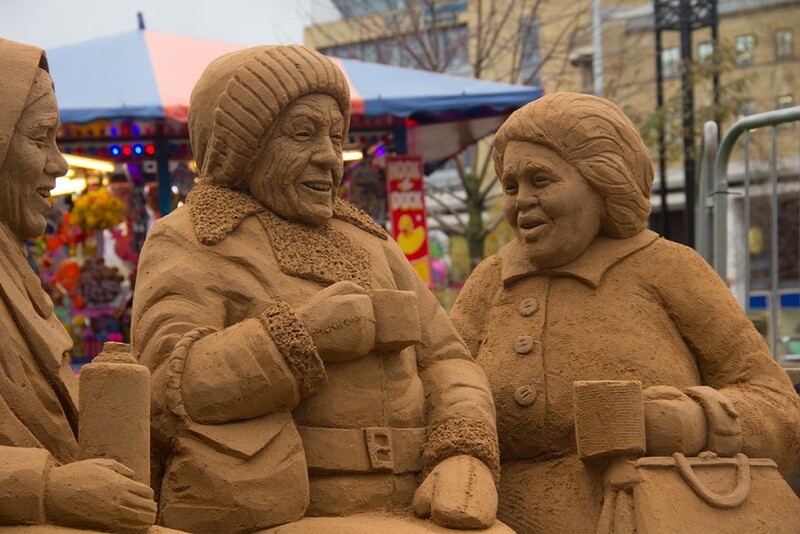 This first movement was the real test as in reality there is no way to gently move a 150kg sand sculpture. Emily’s head shook from side to side but did not topple! Tom then pulled her on the trolley and out over the rather bumpy welcome mat, Emily rocked from side to side with indignation but again her head did not topple! We then lifted her into the van and wrapped her in bubble wrap. A quick clean up and before we knew it books were in the place that Emily was and you would have never known she had been there. 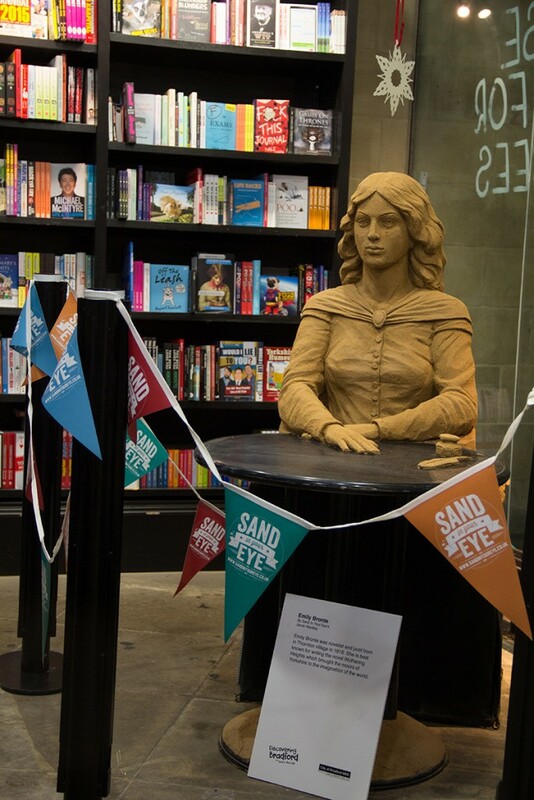 But unlike every sculpture so far to date over the last 12 years Emily Bronte’s time had not yet come and she lives on. At the moment Emily resides in our workshop but we have ideas that it will not be the last time she will ride in our van for her to go to her final home.